Obituary – Munger, Edna Mae (McCracken) « Perry High School Alumni Association, Inc.
﻿Mrs. Edna Mae Munger, 70, daughter of Cherokee Strip pioneers, died at 4 a.m. Tuesday in Perry Memorial hospital following a lengthy illness. Services will be at 2 p.m. Thursday in the First Baptist church with Rev. S. W. Keaton, pastor, officiating. Burial will be in Grace Hill cemetery under direction of Newton funeral home. Mrs. Munger, resident of 628 Holly street, was born Sept. 5, 1898, in the Sumner community, east of Perry. Her parents, Mr. and Mrs. Thomas McCracken, settled there after making the Cherokee Strip run Sept. 16, 1893. The family moved into Perry in 1907. She was married Sept. 14, 1922, in Perry, to William Munger, who survives. She was active in the First Baptist church and served as church secretary for six years until ill health forced her to retire. 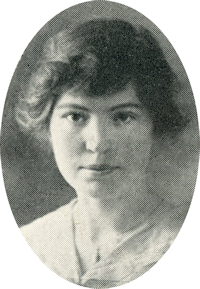 In addition to her husband of the home survivors include four daughters, Mrs. T. Jean (Donna Jean) Reed, Tulsa; Mrs. Fred (Mary Glyn) Cochran, McAlester; Mrs. Vernon (Pauline) Nelson, Lucien; and Mrs. Wesley (Ann) Ross, McAlester; two sons, William, of the home; and George, Perry; and 14 grandchildren.